Since Myanmar (Burma) has been moving towards a democratic system, tourists have been flooding the country and causing two main effects: the country is changing rapidly and prices are exploding. The tourist infrastructure is still in its infancy and cannot cope with the mass tourism seen right now. That's why prices for hotels and all other tourist needs are hitting the sky. Some prices have doubled, some tripled, some even quadrupled since our tour at the end of 2011. Since our last tour in December 2013 they’ve grown another ten to 25% already! 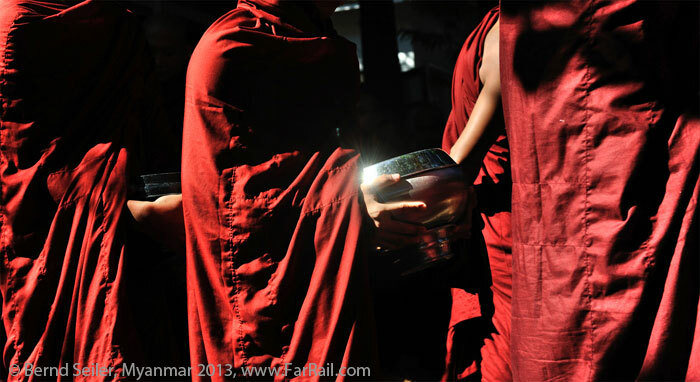 If you want to see the traditional Burma you should not hesitate in visiting Burma right now. It will take a few years before the international hotel chains open new hotels all over the country. Then the flair of Burma will have changed. The international jet set will appreciate the cultural sights and the white-sanded beaches of Myanmar now, as there is no-one any more who will try to give them a guilty conscience and the Anti-Burma Campaign proved to be useless. When new hotels are built and Burma is in the catalogues of all major tour operators, even more tourists will come and change the still existing flair of a remote and traditional Asian country. On our way to some of the highlights of Burma, we'll also stop far away from the beaten track, at places where nothing has been changed for decades. Namtu sees extremely few tourists as it is in a region where you need a special travel permit. Even those few reaching Namtu won't see the corners we're going to. You'll see ancient but well-kept industrial sites, some of them more than 80 years old and still in use. The steam roller will be in steam again for our group and last but not least we'll force the weak and tired 2ft main line loco no.42 up to Wallah Gorge to see both steam locos in front of the wooden loading facility. 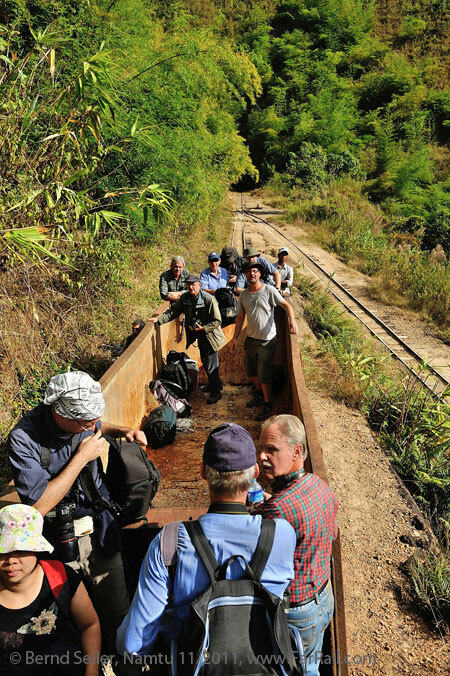 On the spectacular mountain narrow gauge line of the lead and silver mines railway in Namtu there are still two serviceable British (Kerr Stuart and Bagnall) steam locomotives available for charter trains, one of them overhauled by donation of FarRail Tours. Namtu alone definitely justifies the long journey to Myanmar. The complete railway including all technical equipment and its locomotives is running on its very last legs. In Europe officials would have only one “solution” for the line: to shut it down immediately. Fortunately, the new investor decided to keep the line from Namtu to Bawdwin alive and they’ve started to refurbish the track. Progress is very slow in this remote area, so we’ll still be able to experience charter trains which will look fully authentic. It will be hard to say whether these trains were running in the age of regular steam of the early 1980’s or in 2015. The refurbishment of the line ended after a dam in E.R Valley broke during the monsoon in 2011, so we can’t run the last two miles of the line. Ore transportation was stopped completely and, nowadays, only the paytrain, a railcar, runs over the line. After our tour in 2013, the new owner of the mine and railway “adjusted” the long stable government prices another 20%. The prices for their rather lousy - but classy - accommodation is close to being ridiculous, but there is no competition in this area. Hence, we must agree or give the chance for great shots on this superb line a miss. However, no matter what the price might be the railway is a must-go destination. You’ll very likely agree this once you have been there for the first time. The number of participants is limited by the available accommodation. We can only take 24 on this tour (plus a few more who don't hesitate about staying in guest house no.3). The quality of the accommodation in Namtu is very different between the two guest houses. We'll allocate the accommodation according to the date of registration. Those who're first will get the guest house no.1 accommodation, those who are later the guesthouse no.2. More details you'll find below. By charter bus to Namtu (about eight hours), basic accommodation in wooden bungalows of the mine company. 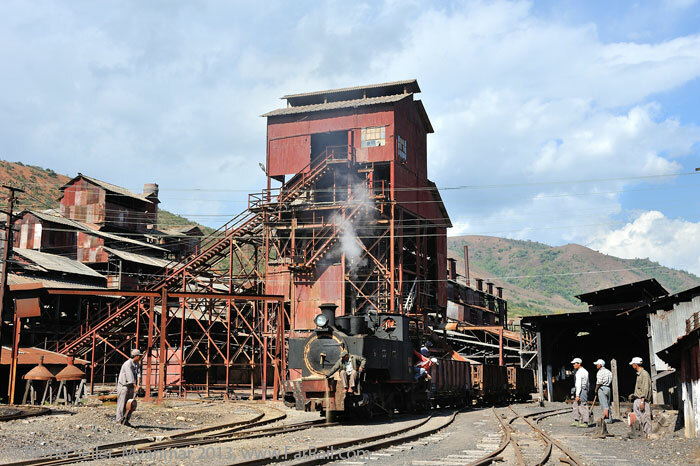 Visit to the Namtu Mines Railway: in the morning we’ll take pictures of shunting operations with No.13 in the railway station, afterwards we’ll steam uphill to the old smelter, a fantastic piece of 1930’s engineering. In the early afternoon we’ll take a charter train up to Lopah, hauled by No.13. Our train will stay in Lopah overnight while we return in one of the round-shaped truck railcars. Accommodation in Namtu. In the early morning, before the morning mist has disappeared, we’ll take a charter railcar to Lopah and board our steam train there. We’ll continue through the fantastic spiral to Wallah Gorge. If possible we’ll take shots of the electric underground mine railway there. Return by truck railcar; accommodation in the guesthouse of the mine. Before dawn we’ll return by truck railcar to Wallah Gorge. Here our steam loco is waiting for us. With a short freight train hauled by No.13 we’ll go over the spectacularly steep line to E.R. Valley, but only as far as the track is good for our loco. After a walk over a broken part of the line we'll continue by a truck up to Bawdwin. In Bawdwin we’ll visit the fantastic and well maintained ancient machinery of the deep mine. A brief visit to the concentrator plant. 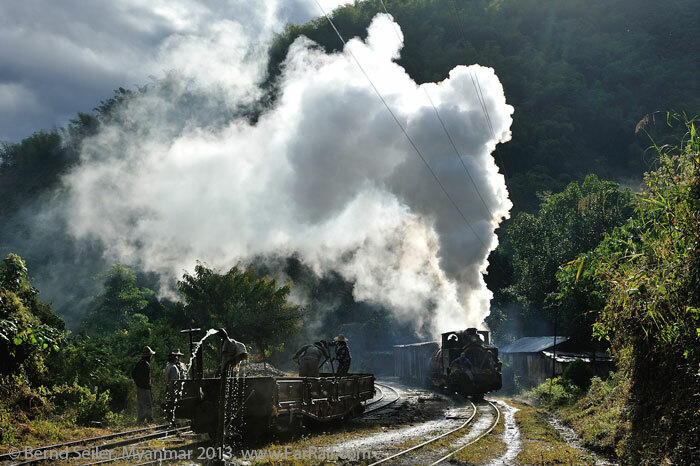 In the dusk we’ll return with our steam charter with No.13 down to Namtu. Guesthouse in Namtu. 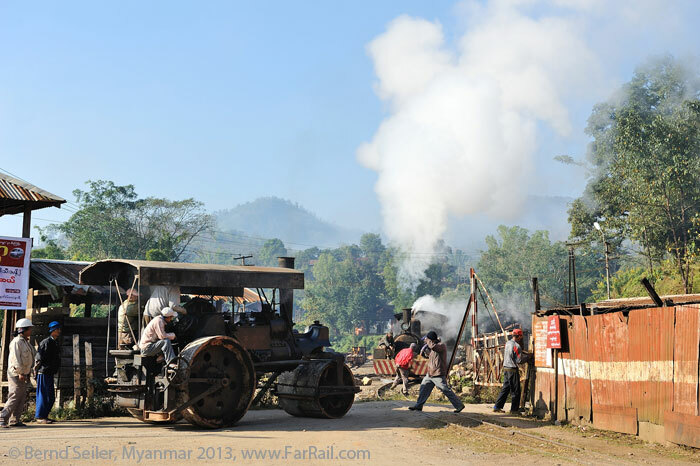 In the morning we'll see a steam road roller at work in Namtu, parallel to the railway. With no.42 we’ll go on the main line, on the steep section to the Mill. In the afternoon charter bus to Pyin Oo Lwin and hotel there. Charter bus Mandalay airport, where our tour ends around noon. Flight connections to Bangkok start in the early afternoon, good to catch any connection to Europe, America or Australia. 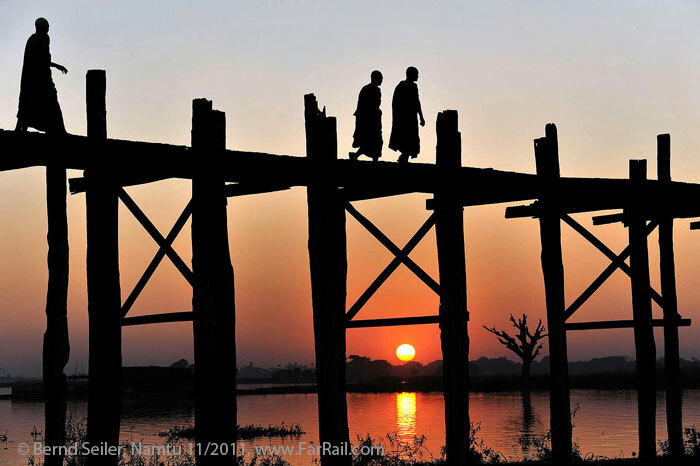 For those who want to see and experience more of Burma: continue by charter bus to the famous U Bein bridge in Amarapura where you’ll meet the group with cultural interest. Individual flight to Mandalay. Flights can be booked by FarRail Tours. Arrival in Mandalay, charter bus for an afternoon visit to the wooden U Bein bridge. We’ll watch the sunset here. The bridge was built in 1784 from teak. Since then only the middle part has been replaced, the rest is still looking original. Once the first “fully-comprehensive-insurance-tourist” falls from the bridge it will almost certainly be spoiled by a huge railing and become less impressive. But for now the 1,200 metres long bridge is definitely a highlight. Amarapura, “city of the immortals”, with its temples, is a fascinating place, especially before all the tourists come out of their hotels. We’ll experience the morning tranquillity at sunrise. As a contrast  only if you want  you can join a visit to the Mahagandhayon monastery. Besides the donated meal for the monks and novices you’ll see the ordinary tourist ecstasy and can imagine what will happen to Burma and its culture if all the big tourist chains occupy the country. In the afternoon we’ll visit the Buddhist Naga-Yon pagoda and, some 7 miles southbound, the former king’s town Ava (Inwa). Afterwards we’ll continue to Sagaing, centre of Buddhism. Already from a distance you’ll have a fantastic view of the hills, strewn with pagodas. After sunset we’ll return to our hotel. If you want you can experience a sunrise and a sunset in the pagoda fields of Bagan. There are hundreds of them, some are truly splendid, some are modest and humble, but in their massive presence and density they form a gorgeous ambience. Hotel in Bagan. The early bird ... and so on. Do like the birds do and take a seat in a balloon to fly at sunrise over the pagoda fields of Bagan. This spectacular view will be unforgettable. If you want to join us ballooning over Bagan you need to register as early as possible for this event. It will cost you an extra of about £210/$355 and is worth every single Penny. That’s why it’s often sold out long ahead. After this event we’ll continue to the airport of Mandalay (some 110 miles). From here we’ll fly to Heho (probably with 6T808 15.30  16.05 hrs; 6T = Air Mandalay). By charter bus we’ll continue to the famous InleLake, surrounded by mountains. On a fast and noisy motor boat we’ll head for our hotel which sits on stilts in the lake. In the morning we’ll go by boat on the Inle Lake to watch fishermen in their traditional boats. We’ll arrange two fishermen to make sure you’ll get the perfect shot. They’ll demonstrate their traditional way to oar and fish. The InleLake became a tourist hot spot some years ago, but is still well worth a visit. If the silting continues as fast as it has in recent decades, the lake will disappear in the not too distant future. The floating gardens pay their toll to this development as well as villages on stilts. Some of them have become islands already. Hotel at Lake Inle. Today you have two options: (A) We stay in and around Bago where we’ll see, besides pagodas (of course, the tallest of Burma is in town), the famous reclining Buddah. 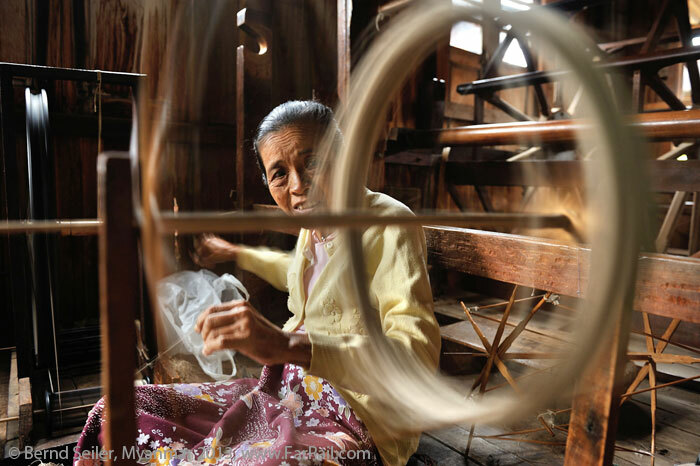 In the afternoon we’ll visit a traditional tobacco factory and a rice mill near Bago. The rice mill still has a stationary steam engine which is spare in case of a power cut. It’s not the peak milling season, so the mill will probably not be at work. However, the machinery is interesting. (B) We’ll visit an elephant camp (ca. 3 hours by charter bus, then about 2 miles as pillion rider on a motor bike and then about 30 minutes walk - or you can ride on the back of an elephant to the camp). You can see the working elephants at their daily fosterage and work duties. As mentioned you can also ride one of the elephants if you’re not too shy. Additional cost for option B: US-$135, payable directly on the spot. In the late evening return to Bago. Early morning visit to Angkor Wat (World Heritage Site). 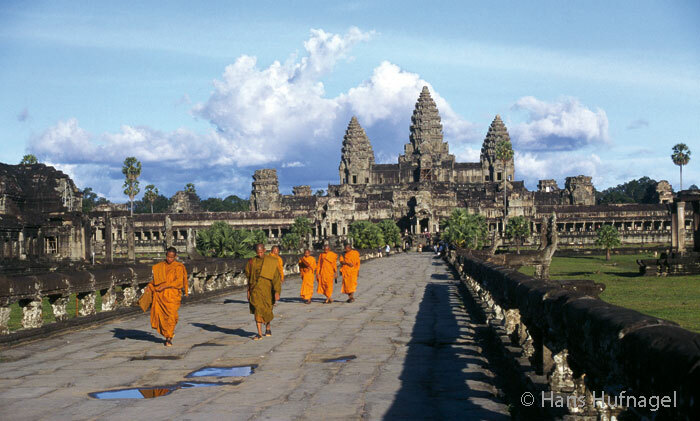 Angkor Wat is among the largest holy places of the world. 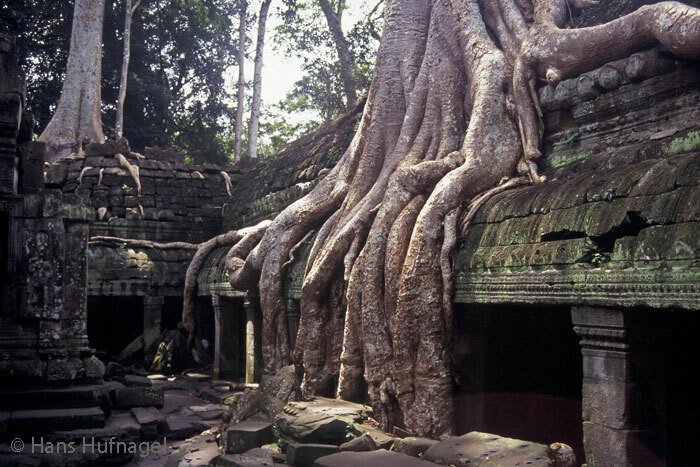 Afterwards we’ll head to the temple of Ankor Thom which is overgrown by the huge roots of a fig tree. It was the backdrop for scenes in the movie “Tomb Raider” with “Lara Croft”. Then we’ll head for the Beng Mealea temple, about 38 miles east of town. The style of this temple is close to what we’ve seen in Angkor Wat as both temples were built under King Suryavarman II. It’s quiet here, in the middle of the jungle, sometimes a little supernatural. In the afternoon we’ll return to Ankor Wat and watch the sunset here. Optionally, you can charter a seat in another balloon which costs a few Pounds less than in Bagan and must be paid on the spot as well. Please book as early as possible. Hotel in Siem Reap. 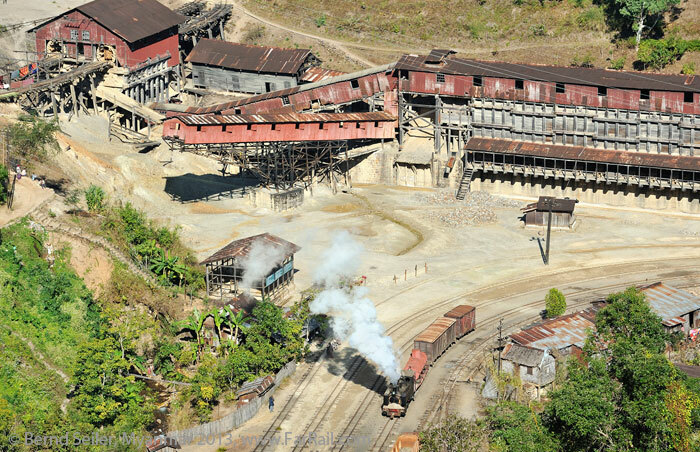 Namtu is the headquarters of the Burma Mines Railways. The Namtu area is restricted. To get a permit to visit Namtu we need to travel in organised groups. 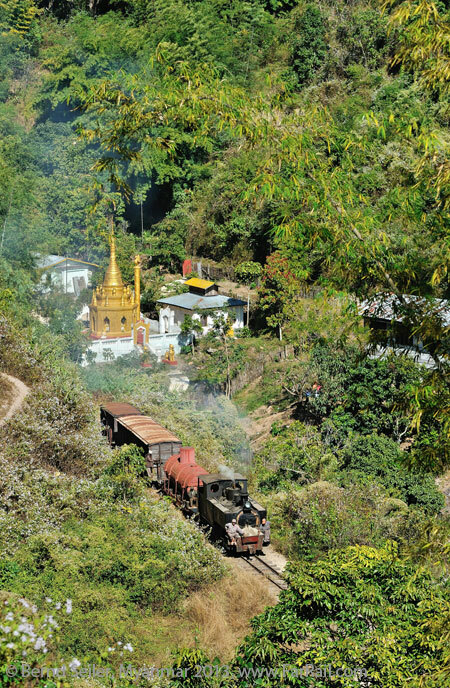 The 2 feet gauge railway used to run from Namyao on the Mandalay  Lashio branch of Myanmar Railways via Namtu to Bawdwin. Silver and lead ore are carried to the smelter at Namtu. 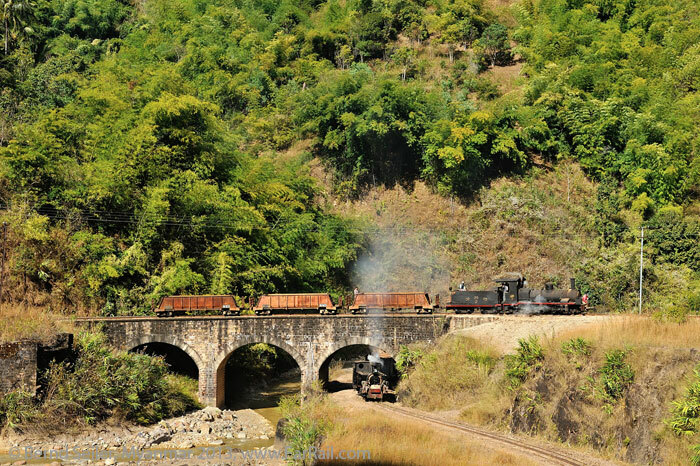 Steam was largely replaced in the 1970s and 1980s but today two steam locos remain in working order. One is Bagnall 2-6-2 No.42, built in 1928 and the other is Kerr Stuart 0-4-2T No.13, built in 1914. FarRail tours paid for the overhaul of No.13 in 2008. Since, the locomotive is in good technical condition. A repair of No.42 made it also available to haul special trains along this exciting mountain railway, but the repair is five years old now and the technical shape of No.42 is doubtful. 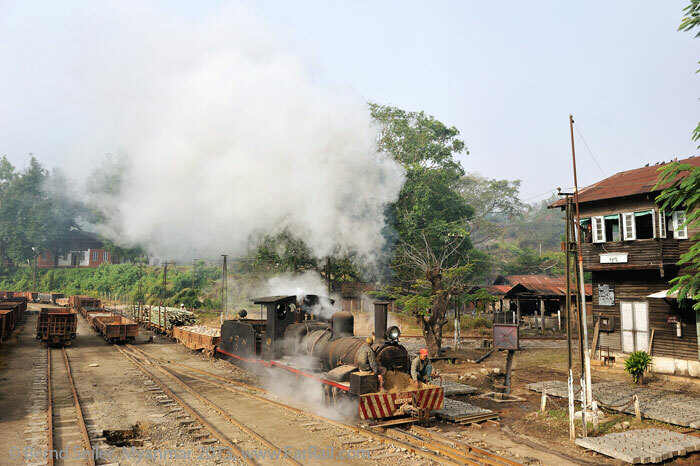 Beside these two serviceable steam locos, there is a small museum in Namtu with four further preserved locomotives (unfortunately with missing parts). The railway also has some very interesting rolling stock and the shed is very picturesque. The rail-trucks or rail-lorries are delightful “critters” in themselves and are a unique feature of the railway. The line is spectacular with hairpin bends, a spiral with a 540 degree curve, two reversals, rural villages, pagodas and steep mountains. The photographic potential is exceptional, so be prepared and bring plenty of film or extra memory cards! In the morning usually one can experience steam exhaust while the afternoons are pleasantly warm. The spectacular 540 degrees curve is just before Wallah Gorge. The line from here to Bawdwin is extraordinarily exciting with reversals, hairpin bends and mountain views. After five years of negotiations and bargaining, arranging and paying for the overhaul of No.13, we finally managed to get steam up to Bawdwin after almost three decades of diesel only trains to Bawdwin. So we’ll go by steam from Wallah Gorge in the direction of Bawdwin! This part was for many years almost exclusively served by lorry railcars and only a few trains went as far as Bawdwin. 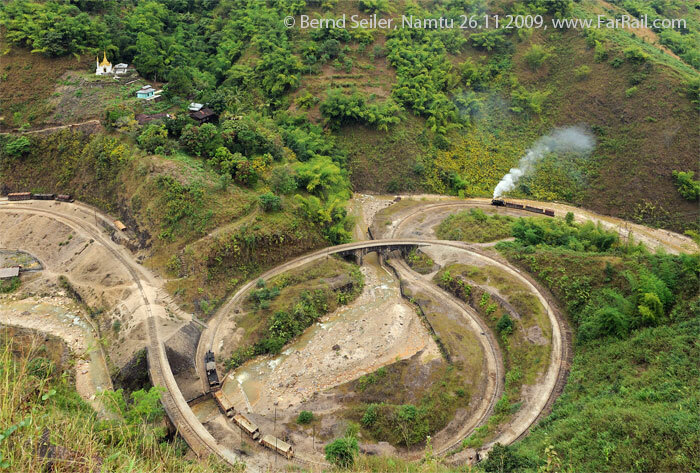 On this breathtaking part of the Namtu Mines Railway, which doesn’t need to take second place behind the Darjeeling Himalayan Railway, we’ll make many runpasts and photo stops. After the 2011 monsoon interrupted the line we can only go up to E.R valley. From there we need to walk about half a mile through the valley to reach the other end of the line. An old shaped lorry will carry us on to Bawdwin from here. Our ambitious programme of railway activities is focussed on using the early morning and the late evening light to get the best possible shots. It’s likely that we’ll need to get up at 5.30am occasionally to get the best results in photography and videography. However, at 6pm it’s dark, so we can get to the accommodation quite early. 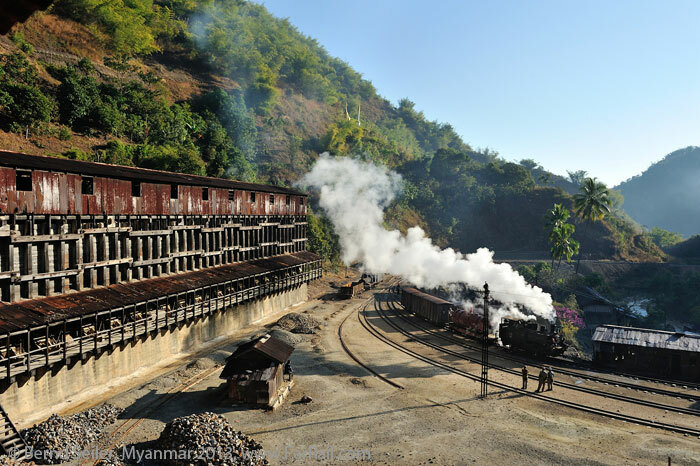 Keep in mind that we’re not going to the Burma Mines Railway to spend the day in a pool at the hotel. We want to see as much as possible. We want to experience something which is close to its expiry date. Besides the very intense steam railway programme, we’ll include some of the most remarkable cultural spots of the country. In the itinerary for 2011 I wrote: "As soon as the political situation changes you’ll never get another chance to see these ancient pagodas and other sights without being bothered by herds of other tourists and local vendors. We’ll see almost only domestic pilgrims to the holy places, a situation similar to what Asia used to be before it became one of the main tourism epicentres. At many places we’ll see almost no aggressive vendors as there is usually at many tourist places all over Asia. So enjoy visiting over 1,000 or even 2,000 year old cultural sights to get an unspoiled impression of the culture of the country." Now exactly this happens. But what we're seeing nowadays is just a prelude. The real mass tourism hasn't started yet. But the location spotters for large tourist companies are there already and it's just a question of time when the tourist stampede will run over the land. Currently you still find moments of tranquillity in the otherwise rushed Asian development. Detailed information about the cultural highlights you’ll find in any guide book. All places we’ve planned for a visit are really interesting. 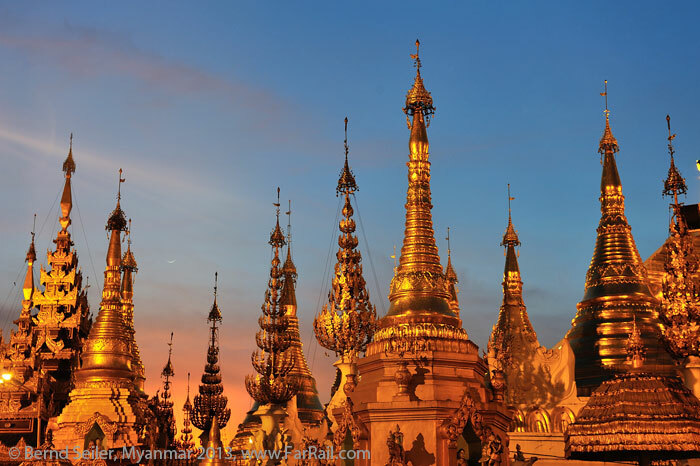 Although we’ll cover many of the main attractions of Burma, we won’t leave the country before we’ve taken a view behind the golden facade and seen the real life. On the cultural part of the tour we’ll go for better hotels, in Yangon a good middle class hotel, on the rest of the tour even a notch better. However, not everywhere can you find really good hotels; the tourist infrastructure is still in its infancy. But a hot shower and air conditioning are standard; our hotel in Bagan has a pool. 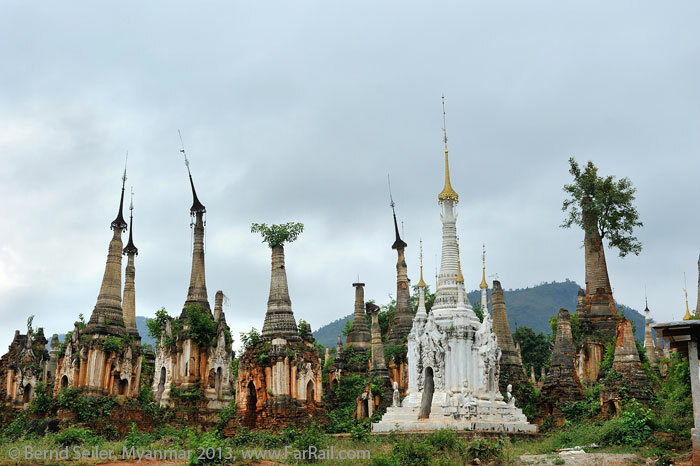 On our tour you’ll see an amazing number of pagodas, some gorgeous, some gilded and renovated and others which tell you their long history by their look; enchanted, in a state of decay, overgrown; whatsoever, in any case, they all beg to be explored barefooted. On Lake Inle we’ll stay in a hotel on stilts which can only be reached by boat. These boats look unstable and shaky, but they’re pretty safe. Their shape has proven to be efficient for centuries and, even with their noisy rattling one cylinder two stroke engine with fly wheel, they lie stable in the water even at a high speed. The traditional rowing boats are a minority on the lake now, but you’ll still see them. Fishermen use one leg and one hand to row over the lake and use the other hand to control the fishing net. For our photographers and video film makers we’ll arrange two traditional fishermen at sunrise. 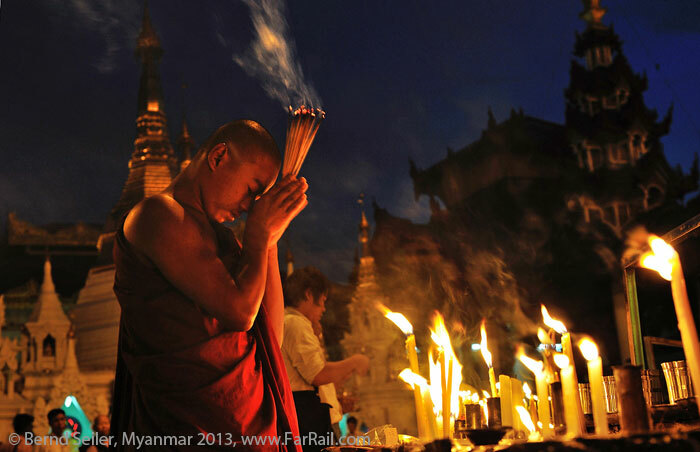 The people of Burma are very religious and very tolerant. However, you should be dressed appropriately, i.e. long trousers or, for a woman, long skirts (trousers are ok as well). Wearing shorts is a contempt of the local dress code for people who could afford to wear proper cloths. Don’t dress too carelessly with your most worn t-shirts or shorts. There are too many tourists already who create the wrong picture in the minds of the locals with their disrespectful behaviour and dress-code. If you’re a portrait photographer please pay respect to the person you want to photograph! You’ll find many interesting people who still have no objections if you ask them  a small gesture is sufficient  but there are also aggressive and unthoughtful photographers who are always in a rush and disrespect the person they want to photograph. Don’t be one of them! Take your time and accept it if a person is not happy to be photographed. If you take your time and talk to the people, you’ll have many more pictures from your visit and will have many more friends! This doesn’t apply to Burma and Cambodia alone, it’s universal. Some difficulties have to be mentioned. Timekeeping is not as important as in Central Europe, Australia or North America. Given this, the scheduled times are a declaration of intent by Namtu Mines Railways and delays of an hour are not unusual. The technical condition of the railway and its equipment is not suitable for guaranteeing anything. It might be possible that some parts of the programme can not be operated as planned and need to be skipped without replacement or compensation. Paid money will not be refunded by any of the Burmese officials or railways, even if they cannot offer what we have paid for. However, we don’t expect serious difficulties in this matter, on all the recent tours the contractors in Burma tried very hard to fulfil all our wishes. Our hotel in Pyin Oo Lwin will be okay. However, our accommodation in Namtu is another matter. The nice, old wooden guesthouse of the mine administration was renovated recently. Although built in the 1950s it is still a British-style guest house with the standards of the 1930s. I would rate it between zero stars and one black hole. Simple, basic bathrooms are available. The shower is working, in one or two rooms, sometimes. We’ll stay also in the old, shabby and very basic wooden guesthouse no. 2 with no working shower at all. They’ll provide us a bucket of warm water to take a special shower: putting warm water over your head with a little bowl! While rooms are large in guest house no. 2, the facilities seem to be as old as the railway (they are not). Toilets in guest house 1 and some in guest house 2 have a water flush, but the installation seems to be from imperial days. Some toilets require a "bucket flush". Anyhow, the people are very gracious and welcoming and give you the best service they possibly can. 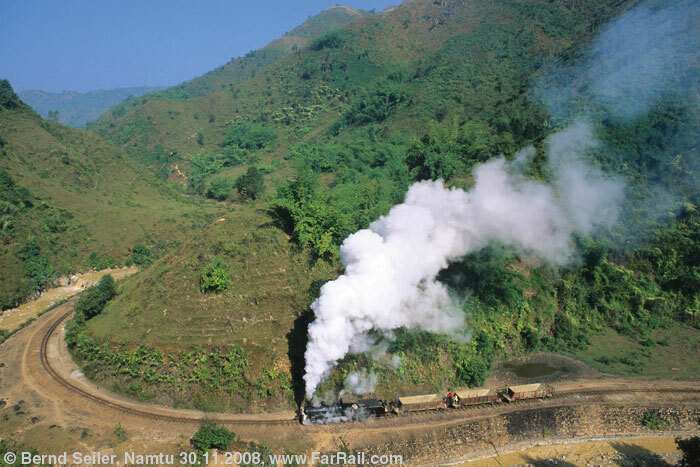 It is a unique experience to get up in the morning to the sound of tropical birds, seeing fog around the hills below our guesthouse, and hearing the first whistle sound from one of our steam locomotives from down the valley. Lack of comfort might be an issue to some. The walking distance between guesthouse one and two is about three minutes. The way is not illuminated, a torch is necessary. We cannot offer single rooms in Namtu. Anyhow, if you insist on a single room there is a guesthouse no. 3 which would only allow a rating of three black holes. The shower facilities are the same as in no. 2 guesthouse, but we need to try to find a dry and clean mattress for you  which is not a feature of this guesthouse. Up to now we could always find one. Please expect "bucket flushing" toilets in guesthouse no. 3. Single rooms are charged with a steep extra price, all you’ll get is less comfort for more money. Just in case our group is small we can offer a few single rooms in guesthouse no. 2. This will not be clear until the booking period has expired. The wooden houses we're staying in are somewhat luxurious for many Burmese families. Many locals, especially in the lowlands, have only a bamboo house and share tiny rooms with many family members. They have no facilities at all, and hot water for washing themselves is somewhat unknown. Compared to these local houses we'll stay in comfort close to being called luxury. The quality of roads is partly very poor. The road to Namtu has some wooden bridges where you might be afraid to cross with our tour bus. Be assured that many loaded trucks cross these bridges on a daily basis, and they are at least twice as heavy as our bus. Please note that morning trains have a higher priority than a breakfast in our guesthouse. So breakfast may be served occasionally as a packed box if necessary. Lunch and dinner are planned according to the situation. If necessary we’ll buy some papayas, bananas and oranges instead of risking missing some good pictures with a time-consuming lunch stop. Beverages are not included in the tour price. 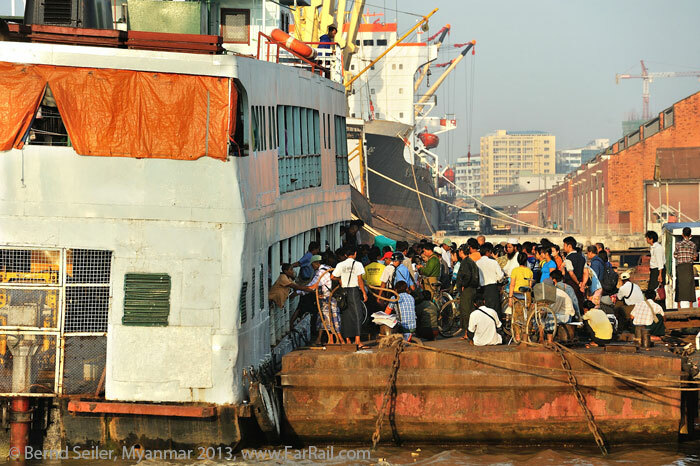 Please bear in mind that accommodation and transportation in Burma fall short of EU, Australian, North American, Japanese - say so called western safety standards. Always use common sense when crossing roads and railway tracks. For instance, if you can’t walk on dark streets in the night please take a strong torch with you. 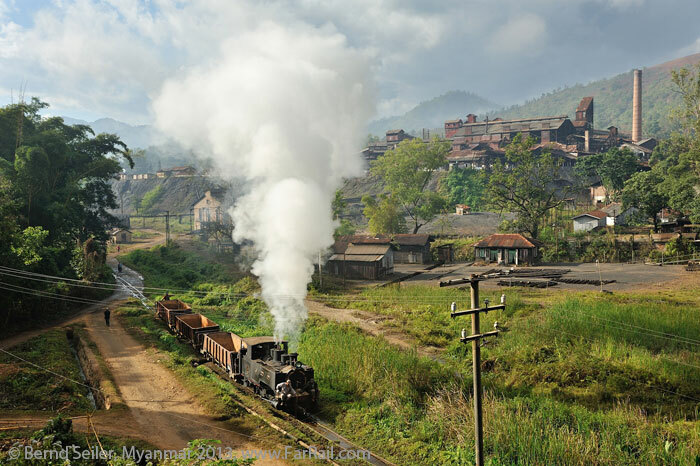 FarRail Tours, or travel agency in Burma or the Burmese Mine Railways cannot be held responsible and will not accept any liability whatsoever in the case of any accident or damage. We suggest you take out a comprehensive overseas accident and health insurance policy. In Namtu we need to sign a waiver from the railways. We recommend that you take some US dollars with you. Airport taxes and visa fees are payable in US Dollars. To change some money at the airport for souvenirs or beverages, other currencies like British Pounds are ok as well. With about $100 US per tour part you should easily be able to cover all expenses. If you want to visit Namtu, then we will need your personal and passport details and a picture of your passport at least three months in advance, to secure the permit. Despite some difficulties we might face, you’ll be positively surprised by this lovely country and its friendly and welcoming people.